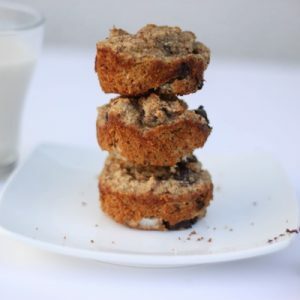 A delicious gluten-free snack recipe using minimal and clean ingredients. This sweet treat also has no added sugar or oils. Preheat the oven to 350 degrees and spray a standard muffin pan with coconut oil or nonstick spray. Divide the mixture evenly to pour into six of the muffin molds. Bake for 20-25 minutes at 350 until set. Let cool completely before using a spatula to remove from the muffin tin. Make a large batch and freeze for a make-ahead snack or breakfast option. Feel free to add citrus zest or fresh berries, too!